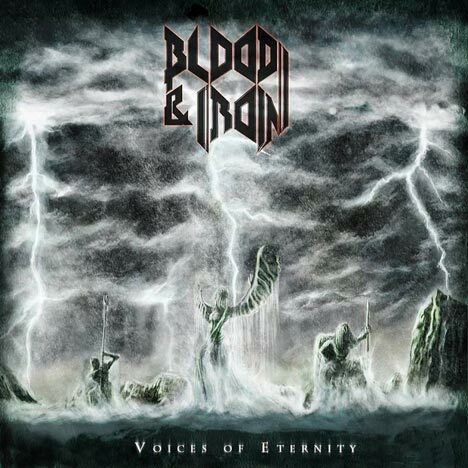 Voices Of Eternity | Blood & Iron | OK Listen! Voices of Eternity is Blood & Iron’s third studio album. Following line up changes in 2010, it was decided that a new line up was required to deliver the kind of music envisioned by the 3 core members of the band. With a total of 7 artists, spread across 3 different countries, this album took about two years to record. Giles Lavery, the lead singer of Australian metal band ‘Dragonsclaw’ has taken on lead vocalist duties on all tracks. Youmni, lead singer of Dubai-based metal band ‘Ascendant’, handles backing vocals on all songs as well as lead vocal parts on ‘Burning Bridges’ and ‘Ghost of A Memory’. Vin Nair, lead singer of Dubai-based rock band ‘Vin Sinners’ takes on the part of ‘the Narrator’ on ‘Ghost of a Memory’. Riju “Dr. Hex”, bassist of Mumbai-based metal band “Albatross” handles the bass on ‘Eternal Rites’.